Searching for Perfect "Tepertös Pogacsa"
I see no search result for "pogacsa" here. I've made them for years and enjoyed the results, but the best have always come from past family and Hugarian delis. 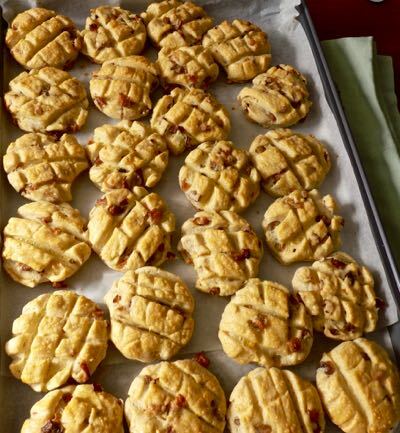 Pogacsa are yeast raised Hungarian biscuits, mostly savoury. There are many types, but the most popular are made with "Tepertö" which arepork cracklings. Fat slabs are diced and rendered for lard and the cracklings are greatly prized for snacking with a bit of salt or for use in biscuits. I've done "tepertös pogacsa" for a number of years using various recipes and approaches and hope that I'm closing in on the best that I had as a child or deli customer in Toronto. The first pic is of today's result. The pieces are nicely "crowned" and browned. The crackling bits are perfect – some recipes call for processing which kills the texture – but the result still works. I would have preferred a higher rise, others would not. I used the amount listed for salt and pepper, but both were lacking. Yet, if this were my first ever bite, I'd be hooked. Here is the recipe I followed and updated in terms of salt and pepper. Combine milk, sugar and yeast and let it rise for a few seconds. Sieve the flour into a big bowl and add one egg, the fat, the sour cream, the salt. Mix the ingredients gently slowly whilw adding the yeast. Mix and knead the dough with your hands to a moist elastic texture using ±1-1.5 dl of water as needed. Roll out the dough to an approximately 40×30 cm big rectangle shape and spread the ground crackling on the top. Roll up the dough, seal ends and roll down gently with the rolling-pin. Fold in half and rest in fridge for 30 minutes. Roll out to a rectangle nce more and fold left and right it into three layers. Let it rest in fridge for another 30 minutes and repeat this process once more. Finally, roll the pastry out, cut a square pattern on the surface. Cut out circles, place them on a baking tin and glaze with a beaten egg. Bake @ 180°C (359°F) for at least 20 minutes till golden. Serve warm – they nuke well following days. This looks intriguing and when I search I find that these can be made savory (like yours) or sweet. It sounds like it should come out with layers but there is no additional fat added before you fold. I am constantly amazed at how many vriations of bread, biscuits, cakes and cookies there are in the world. They all have something in common, though,.....they are enjoyed by any human from anywhere-there is universal deliciousness. Thanks for the recipe and writeup! Yes there is layering, but not to the extent of puff pastry. Some cooks omit the folding and the results are still excellent.